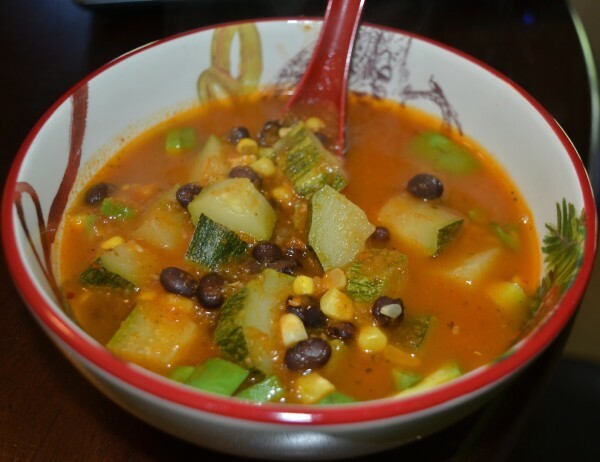 Tortilla soup is something I think I could make in my sleep. Writing up this recipe is harder than the whole process of making the soup! I’ve slowly adapted the recipe over years of making it, but the base has remained essentially the same. The main required ingredients are onion, garlic, cilantro, broth, cumin, and a can of whole-peeled tomatoes. Everything beyond that is up to experimentation and personal preference for additional vegetables, protein, and garnish. 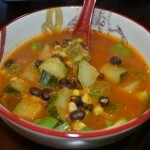 You can make a chicken tortilla soup or a vegetable tortilla soup. Lately I’ve been skipping over the tortilla strips, but I’ve included instructions for making your own at the bottom of the post. I usually start the cooking in a large saute pan, but you can even complete the whole process in a 4-quart pot. You will need a blender for this recipe. Fresh, zesty, spicy-if-you-like-it, and oh-so-tasty. 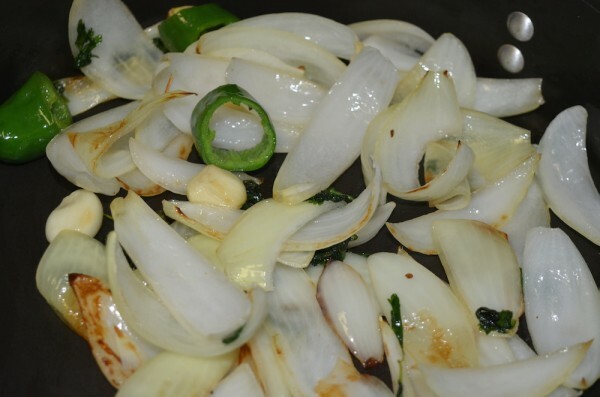 Prep the base ingredients: Peel and cut the onion into approximately equal slices. Peel and crush garlic cloves. Wash and separate 4 Tbsp cilantro leaves. If using jalapeno, rinse and chop. Remove seeds for a mildly spicy soup, keep them for more heat! Heat 1 Tbsp oil (I usually use olive or coconut oil) in a pan over medium heat. 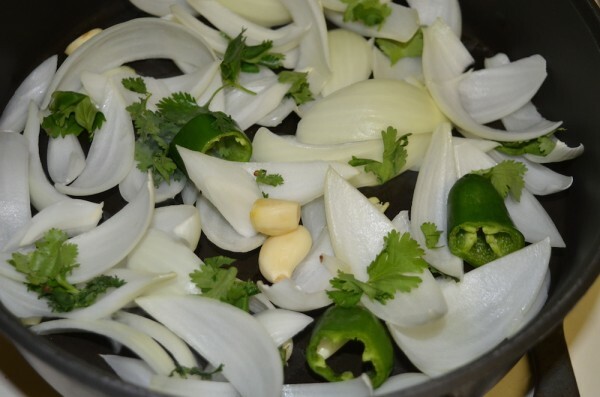 Once heated, reduce to medium-low and add the onion, garlic, cilantro, and optional jalapeno. Add a pinch of salt and saute until softened and lightly browned. Stir occasionally. If using olive oil, make sure you don't have the heat too high. Transfer mixture to blender and add 1/2 teaspoon ground cumin. 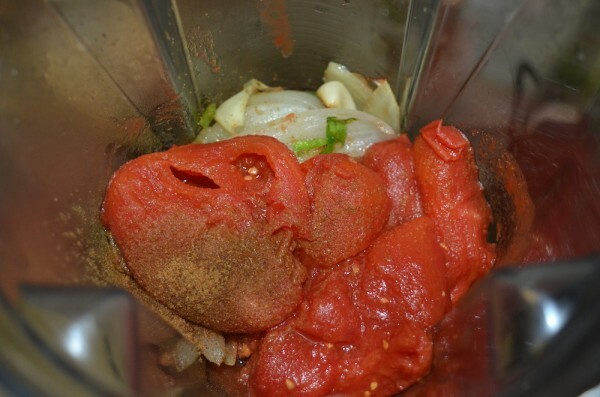 Add half (about a cup and a half) of the whole peeled tomatoes. Reserve the juice and other half of the tomatoes in a container for a future meal. Blend until smooth. 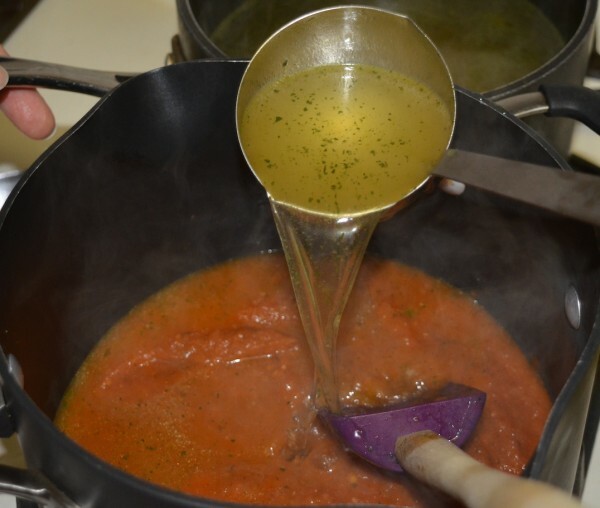 Pour tomato mixture into a 4-quart pot (or something big enough to hold at least 8 cups of liquid comfortably, to be safe) with 1/2 tablespoon of oil over medium-low heat. Cook until slightly thickened and darker in color, about 6 minutes. If the mixture starts to spatter everywhere, you can cover it with a lid. Slowly add 4-6 cups broth (I use vegetable, but you can use chicken if you like) until mixture is desired thickness. Bring to a boil then reduce to a simmer. 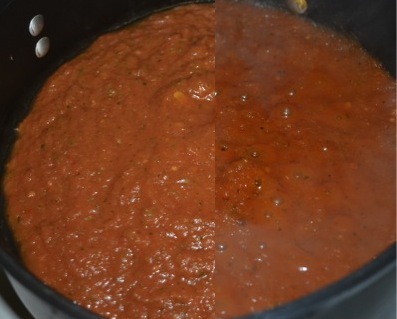 Cover partially and simmer for 10 minutes. Prep your veggies while soup is simmering. 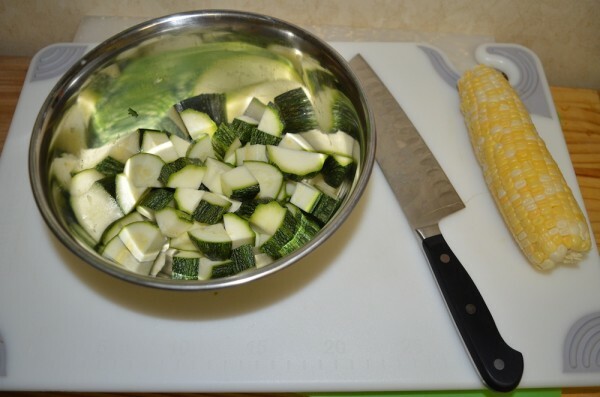 Rinse and chop zucchini if using. I pre-cook my corn in a small pan. After 10 minutes, taste the liquid. Add salt, additional cumin, and/or pepper as needed. Add in vegetables and cook until tender, another 10-15 minutes. If using beans, rinse until all the bubbles are gone and then drain (see note at end of recipe). Add to soup once veggies are cooked and simmer for another 2 minutes. Make any final spice adjustments with salt, pepper, and cayenne pepper. Chop up 1/4 avocado into each bowl, along with a few leaves of cilantro and cheese (any kind you like will work). Ladle in the soup and top with a squeeze of lime. Enjoy! 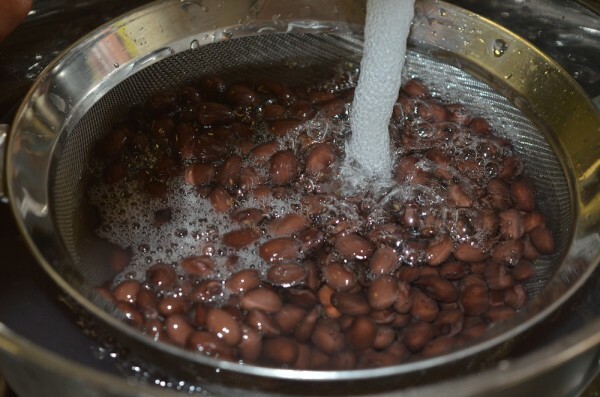 * Rinsing beans: I like to pour the beans into a metal sieve and place that in a large bowl. Fill with water and gently shake. Pour out some of the water and repeat until bubbles are gone, then drain and set aside. * Want to add different vegetables? Go for it! Harder vegetables tend to take longer to cook (like carrots, large pieces of broccoli), so add them slightly earlier than softer veggies like squash or zucchini. * Frying tortilla strips: I call this tortilla soup even though I typically skip over the tortilla part (I can't just call it soup though!). To make your own delicious tortilla strips, cut 3-4 tortillas in half, then slice into 1/4 inch strips. Heat a shallow layer of high heat vegetable oil in a small saute pan over medium heat. Try safflower oil. It is safe to use at high heat, has a neutral taste, and less likely to have undergone chemical extraction processes than other high heat oils. Prep a plate with a double layer of paper towels. Once heated (you can test by flicking a few drop of water into the oil and see if it starts to bubble), add a single layer of strips into the pan. Flip one time during cooking, and remove once slightly browned and crispy. They will become done quickly, so pay attention! I've overcooked my fair share of strips. Remove to drain on paper towel plate. Repeat until all strips cooked, adding oil and adjusting heat as needed. * If you want to make chicken tortilla soup, chop the chicken into small pieces. Similar to the beans, add the chicken at the end of the cooking, and allow to simmer for 4 minutes before serving.